8. NOT BEING PREGNANT WITH TWINS DURING THE SUMMER HEAT!! And our chickens laying their first eggs (in June). And riding my horses. And camping out. And trips to the zoo. And and and. I could keep going and going. What are you looking forward to this summer? I love not having to pile on layers of clothes and jackets every time I leave the house. I love having the windows open and not trying to stay warm all the time. I love baseball season and the annual ballpark trip your dad always plans. I love flowers in the gardens, the woods, and along the sides of the interstates. Tomato and mayonaise sandwiches. Fresh berries. Long walks outside (that I missed the last 2 years but can enjoy again now that I got my knee fixed.) I love sitting outside on your porch and watching Pierce play. This year, I get to watch 3 little people play. Ain't life grand? I guess I am looking forward to being pregnant with TWINS this summer! SURPRISE! But shhhh, don't tell anyone! No kid pictures on this blog post! Try to do better next time. You should never blog without adding a picture of at least one kid. I agree with you on the food on the grill - especially the corn on the cob. And tomatoes, and summertime fruits, farmers' markets (they're the best, especially since we have no Whole Foods or Trader Joe's near us). And camping out . . . all that fun kid stuff outside. But my absolute favorite thing about summer? 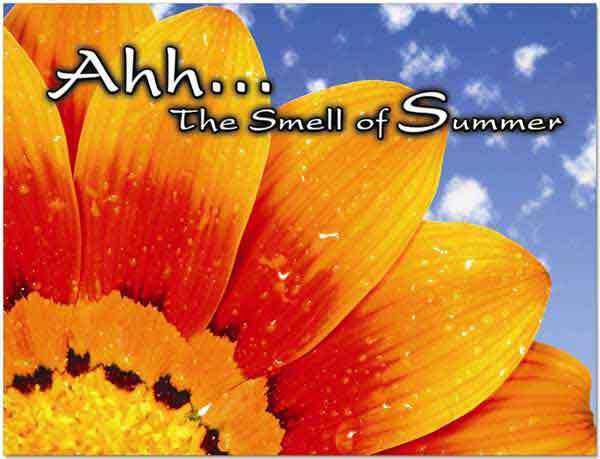 Knowing when that wretched heat and humidity is over, my favorite season, Autumn, is right on Summer's heels! Cool crisp days, changing leaves, that wonderful scent lingering in the air, seeing your breath when you head out for an early morning run. I agree with most of your list! Not the running part. :) I have been wearing flip flops since the snow completly melted. I love them! I love not wearing a jacket and how easy it is to just get up and go. Don't have to take the extra 15 to 20 minutes to bundle up. Just that is great! I love this post. I am kind of laughing at you saying "as we near June" though. Summer takes a bit longer to reach in MN, but I looooooove Spring so much -- the smells and watching all the green come to life is my most favorite part. And being able to be outside more easily, and all the fun things we can do outside : ) Your list was great!